Home » Posts Tagged "Door County vacation home rental"
Spring is just around the corner and that means summer is sure to follow. There is no better place to spend summer than in Door County. Imagine spending time at a beautiful waterfront resort in Ephraim or a unique log home rental in Fish Creek taking in the area’s scenic beauty and spending time doing what you enjoy. For many people, that includes great meals out at a robust variety of restaurants. For food-lovers, Door County does not disappoint and Bay Breeze Resort and its Door County vacation home rental is close to some of the area’s best spots. Start your morning out at Bay Breeze with a walk next door to Good Eggs for one of their made-to-order omelet wraps. Other great places to visit nearby include the Old Post Office Restaurant for breakfast or a traditional Door County fish boil and the Summer Kitchen, which has a great soup bar. Chef’s Hat Café, which is located a mile away from Bay Breeze, is a great spot for breakfast, lunch or dinner. When planning a night out, Alexander’s is just minutes south of Bay Breeze and is a can’t-miss-spot for dinner. They offer casual fine dining with a full bar along with a great Sunday brunch, including mimosas. Just north of Ephraim on Highway 42, check out Sister Bay Bowl where you can roll a game on its vintage six-lane bowling alley while sipping an old-fashioned or sit in their dining room and enjoy the county’s best perch fry. And no visit to Door County would be complete without a stop at Wilson’s Restaurant & Ice Cream Parlor, which is located just down the road from Bay Breeze, for a tasty ice-cream cone or sundae. The staff at Bay Breeze are Certified Tourism Ambassadors and can answer any questions you may have about where to dine or what to do in Door County. Besides Bay Breeze’s well-appointed, comfortable waterfront resort, we also have a beautiful log home available to rent in Fish Creek. Bay View Lodge includes seasonal access to Bay Breeze Resort’s Wi-Fi, private sand beach, heated pool and whirlpool. The log home is ideal whether you are looking for a romantic getaway or a place to spend some quality time with family or friends. Door County is home to some of Wisconsin’s best restaurants that provide a unique dining experience you will not find elsewhere. When choosing Door County lodging, Ephraim is a great choice since it is centrally located on the peninsula and close to everything. If looking for a one-of-a-kind experience, Door County vacation home rentals are a great option. 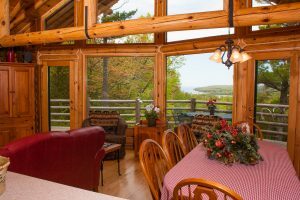 Bay Breeze Resort’s Bay View Lodge log home rental features the best of what Door County has to offer — beautiful scenery, yet convenient to activities and retail. Make a reservation today by calling 920-854-9066 or send an email to [email protected]. Visit www.BayBreezeResort.com to learn more about our family-owned resort and start planning your 2016 getaway.